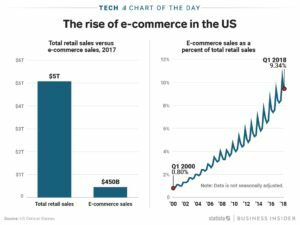 The US e-commerce market is just under 10% the size of entire retail market. On the face of it this would indicate that the game is far from over for big traditional retail. After all, how could such a small segment kill profits for such a huge industry based on enormous traditional players? Yet, Sears – once a Dow Jones component and the world’s most powerful retailer – has announced it will close 100 more stores. The Kmart/Sears chain is now only 894 stores – down from thousands at its peak and 1,275 just last year. Revenue dropped 30% versus a year ago, and quarterly losses of $424M were almost 15% of revenues. Now, in comes a new competitor – like Amazon.com. They have no stores, no store clerks, and minimal inventory due to “e-storefront” selling. So, they are able to lower prices by 5%. That seems pretty small – just a 5% discount compared to typical sales of 20%, 30% even 50% (BOGO) in retail stores. Amazon’s 5% price reduction seems like no big deal to established firms. But, Walmart has to lower prices by 5% in response, which lowers revenues to $95. But the stores, clerks, inventory, distribution centers and trucks all largely remain. With Cost of Goods Sold still $75, Gross Margin falls to $20. Fixed headquarters costs, general and administrative costs don’t change, so they remain at $20. This leaves Operating Income of …$0. How can Walmart survive with no profits? It can’t. To get some margin back, Walmart has to start shutting stores, selling assets, cutting pay, using automation to cut headcount, beating on vendors to offer them better prices. This earns praise as “a low cost operation.” When in fact, this makes Walmart a less competitive company, because it’s footprint and service levels decline, which encourages people to do more shopping on-line. A vicious circle begins of trying to recapture lost profitability, while sales are declining rather than growing. Walmart was (and is) huge. Even Sears was much bigger than Amazon.com at the beginning. But to compete with Amazon.com both had to lower prices on ALL of their products in ALL of their stores. So the hit to Walmart’s, and Sears’, revenue is a huge number. Though Amazon.com was a much, much smaller company, its impact explodes on the larger competitor P&L’s. This disruption is felt across the entire industry: ALL traditional retailers are forced to match Amazon and other e-commerce companies, even though there is no way they can cut costs enough to compete. Thus, Toys-R-Us, Radio Shack, Claire’s and Bon-Ton have declared bankruptcy in 2018, and the once great, dominant Sears is on the precipice of extinction. All of which is good news for Amazon.com investors. Amazon.com has 40% market share of the entire e-commerce business. The fact that e-commerce is only 10% of all retail is great news for Amazon investors. That means there is still an enormously large market of traditional retail available to convert to on-line sales. The shift to e-commerce will not be stopping, or even slowing. Since January, 2010 the future has been easily predictable for traditional retail’s decline. The next few years will see a transition of an additional $2.5 trillion on-line, which is 5X the size of the existing e-commerce market! As stores close new competitors will emerge in the e-commerce market. But undoubtedly the big winner will be the company with 40% market share today – Amazon.com. So what will Amazon’s stock be worth when sales are 5x larger (or more) and Amazon can increase profits by making leveraging its infrastructure and slow future investments? 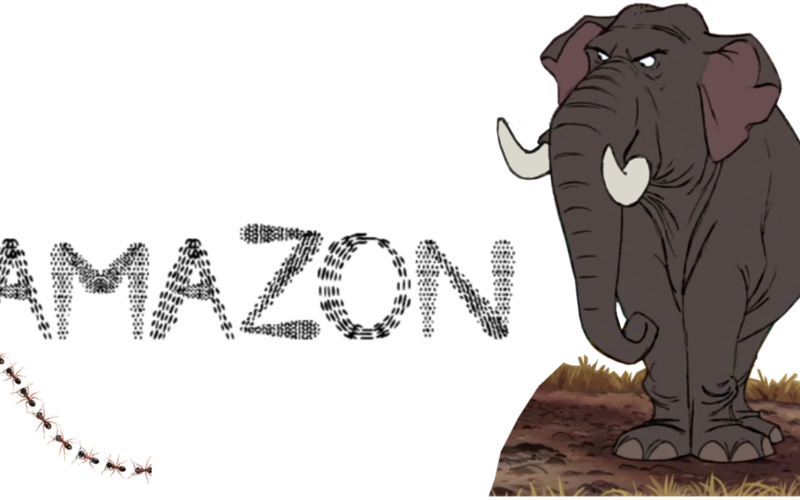 Twenty years ago, Amazon was a retail ant. And retail elephants ignored it. But that was foolish, because Amazon had a different business model with an entirely different cost of operations. And now the elephants are falling fast, due to their inability to adapt to new market conditions and maintain their growth.